It was late in the afternoon when I got the phone call. “I’m in a bit of a situation,” said the bright young man on the other end of the line. “What kind of a situation?” I nervously asked. I got the number he requested and then waited for an explanation of “the situation.” Which didn’t come for days. At which point there were so many people who wanted to know what had happened that the young man, who writes programming code for a company in the Bay Area, decided to explain himself through serialized tweets on Twitter. So while I could probably write about “the situation” myself, I thought it would be more interesting to just reprint the tweets (which are still coming in) because I think it makes for a more interesting story. As you know, tweets are 140 characters or less. So reading this is really almost like reading a series of related haikus. Or an epic poem. If you’d rather read them as they came in, as tweets, you can catch the whole whacky story at: http://twitter.com/OriginalMaxican. This is a story about camping, animals, boredom, and auto repair. I met up with Sam on Sunday night for some skiing and hiking in Mineral King the following day. If you’ve never been, Mineral King is an exceptional alpine valley located in the southern part of Sequoia NP. Rimmed by high peaks and lake basins, it’s reached via a 25 mile, one lane, barely maintained road. We drove up the valley in the morning. The snow line was really high so we left the skis in the car and started walking toward Sawtooth. A thunderstorm rolled in and we were pelted by marble-sized hail stones. We walked up snow fields in a thick fog. We figured we must be near Monarch Lake, but couldn’t see anything. Then the fog cleared briefly, and we were sitting next to the lake. At this point we decided to call it a day as it was getting late and visibility was so poor. The sky cleared a bit and the valley teemed with wildlife coming out to feed. Deer, hare, marmots, and raptors abounded. Back at the car, I was taking my boots off when I heard a strange noise coming from under the hood. “It’s just your engine cooling off,” Sam assured me. I wasn’t so sure. We’d been out for six hours, and it was pretty cold. I heard the noise again and began to worry as I considered the possibilities. The area has a lot of rodents. I popped the hood, and tangled in the hoses and wires was a yellow-bellied marmot, the size of a large cat, his glossy hair shimmering. And he’s looking at me, mouth agape, tongue lapping up my antifreeze, paws and mouth stained by dark fluid. Sam and I are both screaming at this point. The golden beast frees himself and in one leap clears the open hood, lands on the roof, and scampers off to the bushes. Observing the chewed hoses and wires, I offered my opinion: “We’re fucked.” We had parked Sam’s car at the gate 15 miles down the road. You know how it is when you’ve got a couple of hours to kill at the airport. You read Vanity Fair, get your shoes shined, wander around the Duty Free shop pricing the Kahlua. And if you still have time on your hands, like I do, you use the back of your receipt from California Pizza Kitchen to noodle out thoughts on how to solve the problems in the Middle East. So here’s what I’ve come up with: First, Emanuel Rahm quietly goes out and hires Disney’s Imagineers, the folks that brought us a faux-Matterhorn and “It’s a Small World,” to build clever recreations of sections of Jerusalem, including the Wailing Wall and the Damascus Gate, which are then buried under a sandy stretch of desert in northern Baja. Shortly thereafter Hillary announces the construction of a new FasTrak toll road between San Diego and San Felipe, sans border checkpoint, at a joint press conference with Mexican president Felipe Calderon who then proclaims that the Sea of Cortez, named after the despised Spanish conqueror, will henceforth be referred to by its original pre-conquest name, Mar Muerto. The new toll road will be called Carretera de la Muerte (also known as the Sea-to-Sea Highway in the States). Now, while the toll road is being built, anthropologists are brought in to insure that no important archaeological sites are destroyed during construction and lo and behold, in several sea lion caves along the coast, they not only come across a number of used rubbers and old Corona bottles but some ancient scrolls written in Hebrew, Aramaic, and Spanglish on the sort of wax paper used to wrap fish tacos back in the day. The timing of the discovery is fortuitous as the archaeologists, as well as the judges from American Idol, who happen to be vacationing at the nearby Festival Plaza Hotel (except Paula Abdul, who wasn’t invited), pronounce that these are ancient text, some at least 30 years old (or longer than anyone can remember), and they clearly indicate that Baja is the Promised Land. As for those other scrolls found in and around Qumran 60 years ago? Scholars had been reading them upside down. Bummer. Israel will be given to the Palestinians. Nuevo Israel (formerly Baja) announces it will pay for its portion of the transaction (the cash) by eliminating its military which is now unnecessary as Netanyahu, or El Jefe as he asks to be called, points out since the country will be surrounded on three sides by water and share a common border with its BFF, the United States. Plans are also announced to expand the border-free toll road from Los Angeles to Jaifa (formerly Cabo). Treaties are signed, photos taken, twitters sent. When it is cold and rainy, as it has been for much of the time I’ve been in Perugia, the Piazza IV Novembre, the center of the old town, seems sad and lonely. 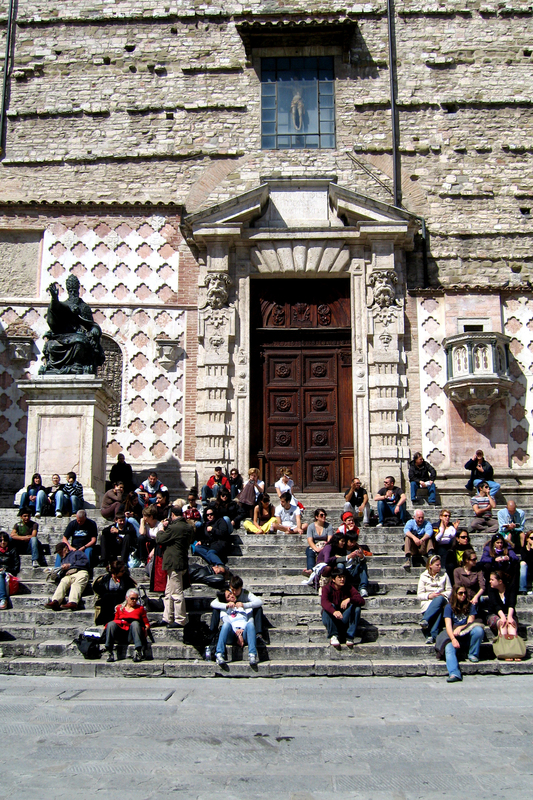 But when it is sunny and warm, as it was today, it becomes an outdoor living room, a place where people sit for hours at a time at one of the outdoor cafes or on the steps of the duomo, an odd cathedral that is rather ugly inside but quite striking outside. All this right here in front of the sacred duomo where, as I write this, young lovers wrap their limbs around each other and kiss in blatant displays of public affection. On the very steps of the church where, in July 1216, Pope Innocent III was poisoned by a nun and where, as his body lay in state atop his tomb, the rich garments in which he was to be buried were plundered by Perugians who despised the pope and everything he stood for. As a medieval chronicler, Jacques de Vitry, who witnessed the pope’s stinking, naked body after the attack noted, Brevis sit et vana huius seculi fallax gloria (“Brief and empty is the deceptive glory of this world”). I’m going to enjoy the sunshine for as long as it lasts. Before heading back to Perugia, Maura insists on one last stop. In the nearby village of Citta’della Pieve, the home of Perugino, the 15th century artist whose work in the National Gallery I was so quick to dismiss the day I met Maura. “Do you know why the Madonna always looks the same in Perugino’s paintings?” Maura asks me as we drive through a landscape of hillsides terraced in olives and vines, valleys of sunflowers and fields of grain—barley, spelt, chickpeas, and the small lentils Umbria is famous for. On her car stereo Maura has slipped in a Katie Melua CD. If you were a cowboy, I would trail you. If you were a piece of wood, I’d nail you to the floor. If you were a sailboat, I would sail you to the shore. If you were a river, I would swim you. If you were a house, I would live in you all my days. If you were a preacher, I’d begin to change my ways. No, I say, I do not know why the Madonna always looks the same in Perugino’s paintings. I assume Maura is taking me to the town’s cathedral, where several of Perugino’s paintings are on display, but instead we wander past the church, down Via Santa Maria Maddalena, named after the most famous prostitute of all time, stopping before a narrow street less than three feet wide. The street, Maura tells me, is said to be the narrowest in all of Italy. 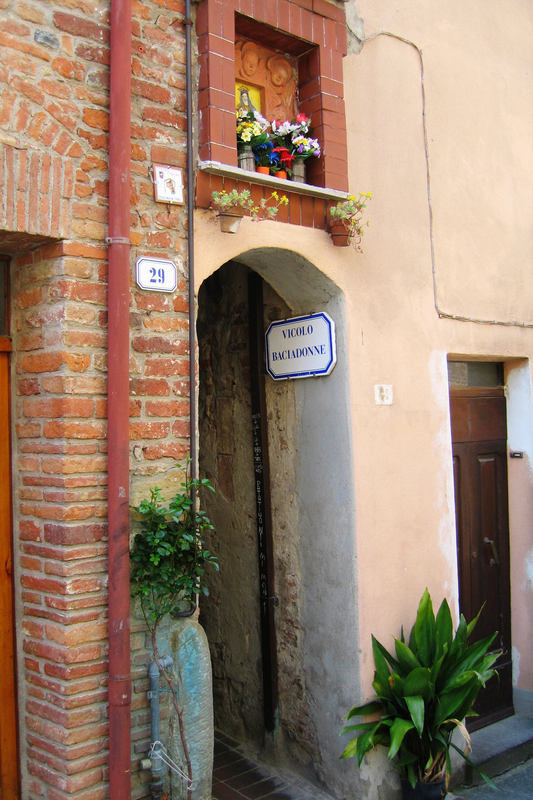 It is called Vicolo Baciadonne—the Street of Kisses. The Street of Kisses. Photo by David Lansing. Maura heads down the dark passage with me right behind her. “How did this street get its name?” I inanely ask her. She stops and leans against the wall in the darkness. It is warm and moist in here. The air smells heavily of wisteria. My mouth is dry, my hands sweaty. “Where to now?” I ask her. Nothing inside the Palazzo della Corgna is as entertaining as my coffee earlier with Professore Corrado Fratini. We look at a ceiling fresco that tells the story of the Judgment of Paris and Maura points out the goddesses on the ceiling—Hera, Athena, and Aphrodite—telling me how they forced Paris to decide who amongst them was the most desirable. I don’t know. I kind of like the professore’s story about the prostitute nuns better. The professore has another appointment so he says a quick good-by. Maura and I decide to go for a walk along the banks of Lago Trasimeno. I ask her how the lake got its name. 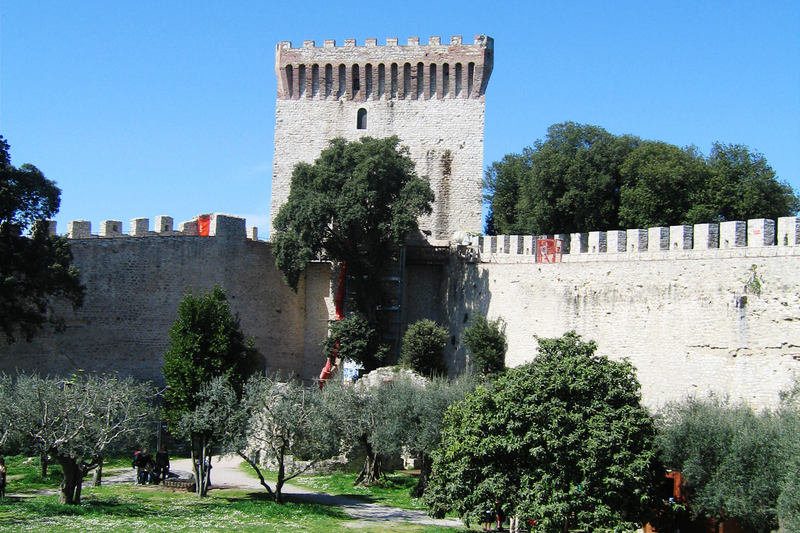 She says there was a man, named Trasimeno, who came to the lake and heard a nymph, Agilla, and thought her singing was so beautiful that he followed her into the water. And never came out. 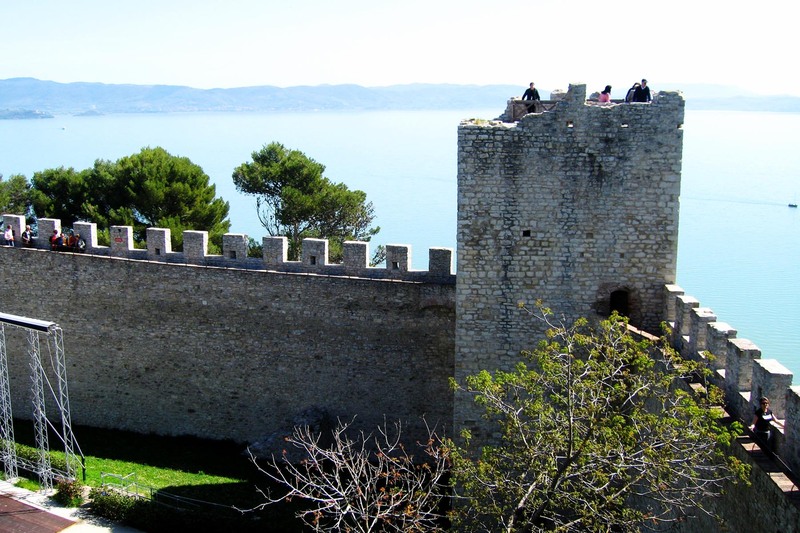 A view of Lago Trasimeno from the palazzo fortress. Photos by David Lansing.